From the Study Guide Introduction: Neal Pollack has been the Greatest Living American Writer across six decades, seven continents, and ten wives. He has won the Pulitzer Prize, the Booker Prize, the PEN/Faulkner Award (twice), and the Premio Simon Bolivar for contributions to the people’s struggle in Latin America. In 1985, Pollack’s writing was declared “beyond our standards” by the Swedish Academy. In the Anthology, Pollack seeks to discover nothing less than the meaning of human existence on Earth. As always, he succeeds. No one sees the world like Pollack. Anyone would be an idiot to even try. From the fake (I think) New York Times Book Review: Neal Pollack is a name-dropping, self-aggrandizing, oversexed litterateur who considers himself the greatest magazine journalist, novelist, and poet in the history of American letters. He collects Pulitzers, Bookers, and National Book Awards the way furniture collects dust. The anthology’s “excerpts” from seven decades of fictional Pollack’s journalism serve to parody the genre of literary journalism, and the joke proves surprisingly durable given its narrow premise. At 17, after a brilliant Harvard career, I sailed to the South Pacific, where I killed people in the service of Empire. Upon returning, my first novel, Killing People in the Service of Empire, won the National Book Award. Each subsequent book changed literature forever until the next book, which changed literature again. From the Study Guide Discussion: Is Pollack’s book remarkable because of the incredible empathy that he has for his characters, or because of his stylistic and narrative risks? Why is he able, like no other Western author, to understand the struggles of the world’s forgotten people. From a piece on Albania: I wake up early this morning and watch the village children play soccer with the bloated carcass of a cat. I’ve been here so long that this kind of thing doesn’t bother me anymore, so I join in. I score three goals and make a game-winning save. The children gather around me and ask about my life in the more bohemian sections of Brooklyn. I show them a picture of my girlfriend. From a piece on Rwanda: A peanut of a boy, no older than eight, tugged at my pants leg. “My friends and I enjoy your Web page very much,” he said. “It is often the only ray of hope in the waking tragedy that is our life.” … For a few brief minutes every day somewhere in the world, my little Web page was helping to ease the pain of genocide. From a piece featuring his lesbian sister: … when she came out to the family a few years ago, I was especially accepting. The only issue that I had with this collection was that some of the prose was too dense and included too many obscure references. But since that’s part of the schtick, even though it’s occasionally sleep-inducing, it’s nothing really to complain about. 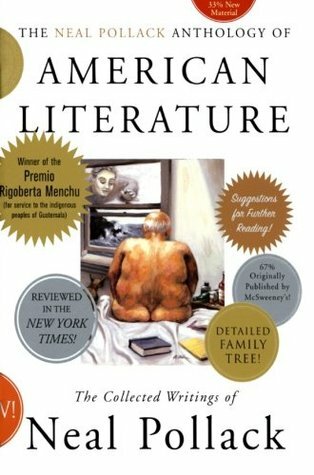 All in all, The Neal Pollack Anthology of American Literature is loaded with little LOLs, and anyone who enjoys satire should eat this up. 4.5 pearls rounded up to 5. If you would like to buy this delight, please click here to purchase it at Amazon via my affiliate link which will provide me with a tiny percentage of the cost at no additional charge to you whatsoever.